Carbon-built and ultralight-light, the Rapide CRX brings sensational speed to any CrossCountry ride or race. With fantastic XC geometry and race-ready components, it handles superbly over every trail, bump and route to the finish line. Coming equipped with long, slack and low XC race geometry from its T7-HM-UD carbon construction, the Rapide CRX packs plenty of tech to keep you out in front. A 100mm travel RockShox Sid RL fork with remote eats up every impact on your route around the XC course, pushed on by superb SRAM X01 Eagle 1x12 gearing and wide DT Swiss wheels with Maxxis 3C tyres. Offering fantastic stopping power, the SRAM Level TL disc brakes keep you in full control when cornering and scrubbing. With the Rapide CRX, a fast and furious XC experience awaits. 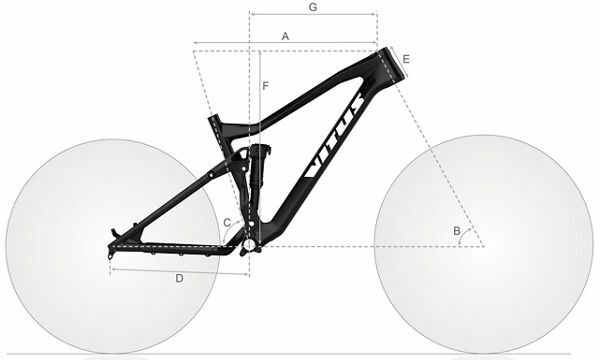 What are the main differences between this and the &pound;700 cheaper Vitus Rapide VR Mountain Bike (NX Eagle 1x12 - 2019)? It is difficult to tell from the spec but there seems to be a lot of the spec that is identical between the two bikes. They seem to have the same frame but how can one be 40% more expensive? OK, I assume that gears and brakes are better quality but the weight will be about the same? Essentially, I'm asking how can the CRX be 40% better than the VR? The frame seems to be unchanged since 2016 - is this correct. The frame geometry is indeed similar to previous years as the design was very successful. We wouldn't be able to predict if this would change in the future. Would this frame accept the same tyre combination in 2.35&rdquo; width instead of 2.20&rdquo;? Yes, this bike can accept the 2.35&quot; tires.